Tube map designer Harry Beck is to have his iconic design officially commemorated, on the 80th anniversary of its first public appearance. An English Heritage Blue Plaque will be unveiled later at Mr Beck's birthplace in Wesley Road, Leyton, east London. His design used an easy-to-follow grid system on which all subsequent maps on the expanding network have been based. The blue plaque, designed using famous London Underground font, will be unveiled at 10:00 GMT. This year is the 150th anniversary of London's Tube. Previous Tube maps had proved relatively unsuccessful, with creators' concern with geography and distance between stations leading to hard-to-decipher guides to stations. Beck, who died in 1974 aged 72, worked out that people did not need to know the true distance between stops. The plaque will be unveiled by London Transport Museum director Sam Mullins who said: "Beck's map was revolutionary in its simplicity. "It has become a London icon and influenced the design of many Metro maps across the globe, as well as being the inspiration for many contemporary artists and designers." 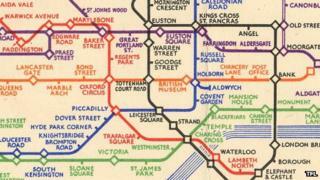 Mr Beck worked with London Transport as an engineering draughtsman before he designed the map. Even after he left the employment of London Transport he still worked on the diagram. His last version of the map was published in 1960, after which a dispute over its remodelling by other designers led to a rift with his former employers. Despite this, he continued to work on updated designs on his own, featuring the new Victoria Line as a neat lilac diagonal line. But these, or his prototype for the Paris Metro map, were never used. Mr Beck was notably ahead of the game in producing a version of his London map showing all underground and surface level train services as early as 1938. At the time, this was deemed too complex for publication, but today such an integrated map appears at all London stations.